Fifteen years ago today — October 20, 1995 — the Space Shuttle Columbia launched from the Kennedy Space Center, carrying seven astronauts and the United States Microgravity Laboratory on its second mission. The launch was scrubbed six times before STS-73 got off the ground. Once in orbit, astronauts Kenneth D. Bowersox, Kent V. Rominger, Kathryn C. Thornton, Catherine G. Coleman, Michael E. Lopez-Alegria, Fred W. Leslie, and Albert Sacco, Jr., spent over two weeks* performing a variety of experiments in fluid physics, materials science and processing, biotechnology, and combustion. *Mission duration: 15 days, 21 hours, 52 minutes and change. Ten years ago today — October 11, 2000 — the Space Shuttle Discovery launched from the Kennedy Space Center on mission STS-92, en route to the International Space Station. STS-92 was also known as space station assembly flight ISS-05-3A. U.S. astronauts Brian Duffy, Pamela A. Melroy, Leroy Chiao, Peter J.K. Wisoff, Michael Lopez-Alegria, and William S. McArthur, along with Japanese astronaut Koichi Wakata, spent 12 days in space, about half of which involved adding the Z1 Integrated Truss and the third Pressurized Mating Adapter (PMA-3) to the space station. EVA #1: 6-hours, 28-minutes — connection of electrical umbilicals to provide power to heaters and conduits located on the Z1 Truss; relocation and deployment of two communication antenna assemblies; and installation of a toolbox for use during on-orbit construction. EVA #2: 7-hours, 7-minutes — attachment of the PMA 3 to the ISS and preparation of the Z1 Truss for future installation of the solar arrays that will be delivered aboard STS-97 in late November. EVA #3: 6-hours, 48-minutes — installation of two DC-to-DC converter units atop the Z1 Truss for conversion of electricity generated by the solar arrays to the proper voltage. EVA #4: 6-hours, 56 minutes — testing of the manual berthing mechanism; deployment of a tray that will be used to provide power to the U.S. Lab; and removal of a grapple fixture from the Z1 Truss. Two small rescue backpacks that could enable a drifting astronaut to regain the safety of the spacecraft were also tested. The image below shows astronauts testing the SAFER rescue backpack. Twenty years ago today — October 6, 1990 — the Space Shuttle Discovery launched from the Kennedy Space Center on its mission to deploy the Ulysses spacecraft. STS-41 astronauts Richard N. Richards, Robert O. Cabana, William M. Shepherd, Bruce E. Melnick, and Thomas Akers successfully released the joint NASA-European Space Agency payload and its two upper stage boosters. This mission was the first to require both an Inertial Upper Stage and a Payload Assist Module, because of the need to send the Ulysses craft out of the plane of the ecliptic. Ulysses first traveled toward Jupiter, where a gravity-assist maneuver in February 1992 helped put the spacecraft into its final out-of-ecliptic solar orbit. Desiged to last only 5 years, Ulysses actually operated for over 18, studying the polar regions of the sun during both solar minimum and solar maximum conditions. Ulysses operations ended on June 30, 2009. Ten years ago today — September 8, 2000 — the Space Shuttle Atlantis launched from the Kennedy Space Center on a mission to prepare the International Space Station to receive its first crew. STS-106 carried astronauts Terrence W. Wilcutt, Scott D. Altman, Daniel C. Burbank, Edward T. Lu, and Richard A. Mastracchio, along with cosmonauts Yuri I. Malenchenko and Boris V. Morukov, on an 11-day mission to the nascent space station. They unloaded supplies; routed and connected power, data, and communications lines; installed equipment; and boosted the station to a higher orbit. In other space history, on this date a half-century ago, President Eisenhower and Mrs. George C. Marshall dedicated the Marshall Space Flight Center in Huntsville, Alabama. Twenty-five years ago today — August 27, 1985 — astronauts Joe H. Engle, Richard O. Covey, James D. Van Hoften, William F. Fisher and John M. Lounge lifted off from the Kennedy Space Center aboard Space Shuttle Discovery. Mission STS-51I lasted a week, during which the crew deployed three communications satellites: American Satellite Company 1 (ASC-1), Australian Communications Satellite 1 (AUSSAT-1), and Synchronous Communications Satellite IV-4 (SYNCOM-IV-4), also known as LEASAT-4 because most of its communications capacity was to be leased out to the military. After attaching special electronics assemblies to LEASAT 3 during two days of space walks, astronauts manually launched the satellite again. The electronics allowed ground controllers to turn on the satellite and, at the end of October, fire its perigee rocket and send LEASAT 3 into orbit. While LEASAT-3’s repair was a success, LEASAT-4 developed its own problems. The satellite reached its intended orbit, but its ultra high frequency (UHF) downlink failed during testing and it was declared a total loss. 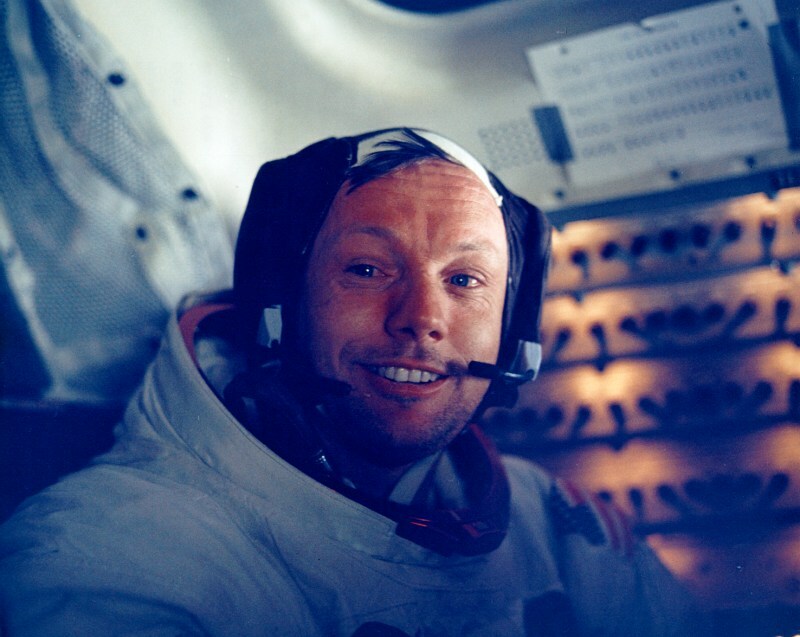 Eighty years ago today — August 5, 1930, Neil A. Armstrong was born in Wapakoneta, Ohio. He grew up to be the first man to walk on the surface of the Moon. And 35 years ago today, in 1975, test pilot John Manke glided the X-24B to a safe landing at Edwards AFB, thereby proving the concept that would allow Space Shuttles to return from orbit and land safely. 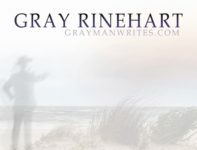 Shameless plug: Speaking of (typing of?) walking on the Moon, my alternate history story “Memorial at Copernicus” concerns a lunar excursion in the future, made possible by an Apollo flight that never was. It’s in this month’s issue of Redstone Science Fiction. Forty-five years ago today — June 3, 1965 — astronauts James A. McDivitt and Edward H. White launched from Cape Canaveral on a Titan-II rocket. 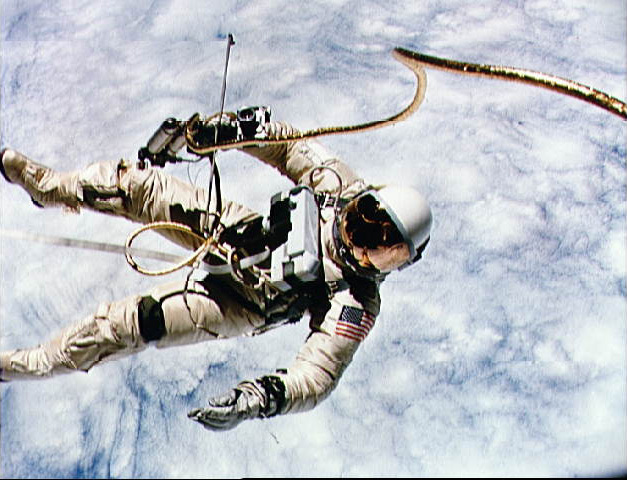 A little over four hours into the flight, Ed White stepped out of the Gemini-IV capsule for the first-ever extravehicular activity (EVA) by a U.S. astronaut. His EVA lasted about 20 minutes and met all the mission objectives, though he and McDivitt had some trouble getting the hatch closed when he got back in the spacecraft. Some great high-resolution images of the EVA are available at http://nssdc.gsfc.nasa.gov/planetary/gemini_4_eva.html. Is any conclusion possible after so many years, when the supporting evidence has been trashed and the eyewitness testimony has become fossilized by countless repetitions? The principal leg of the [UFO enthusiasts’] endorsement — that there weren’t any candidate objects within 1,000 miles — has been demolished by the recognized presence of the beer can-shaped Titan-II stage. McDivitt, more than a decade after the fact, refused to believe he could have misidentified that object — but both his degraded eyesight [because of issues in the Gemini capsule] and different viewing angle at the time of the sighting eliminate any reliability from that claim — and years of UFO research have taught us the surprising lesson that pilots are, in truth, among the poorest observers of UFOs because of their instinctive pattern of perceiving visual stimuli primarily in terms of threats to their own vehicles. As to that last bit, about pilots perceiving objects as threats until proven otherwise … that’s probably a good thing. And possibly a lesson we could apply to other endeavors. Forty years ago today — June 2, 1970 — NASA test pilot William H. “Bill” Dana flew the Northrop M2-F3 lifting body on its first flight. 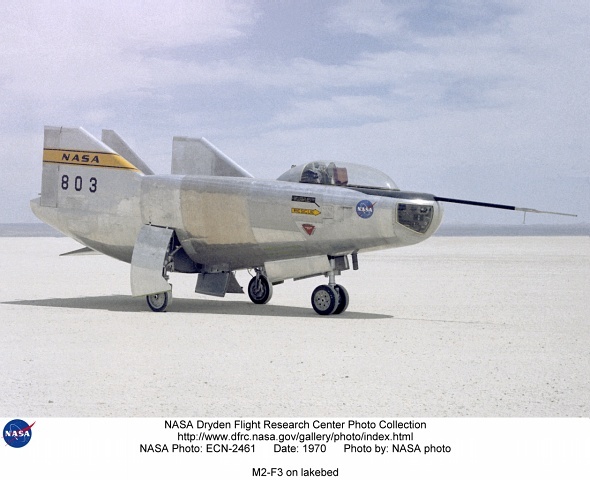 The M2-F3 was one of a series of lifting bodies flown by NASA and the USAF to test spacecraft reentry. On this flight, it was dropped from its B-52 mothership and Dana glided it to an unpowered landing on the dry lake bed at Edwards AFB, much the way Shuttle pilots glide their vehicle back to Earth. The M2-F3 was rebuilt from the crashed M2-F2, with a center stabilizer added to reduce the pilot-induced oscillations that had caused the M2-F2 landing mishap. Powered flights of the rocket-equipped M2-F3 eventually took it up to Mach 1.6 and over 70,000 feet of altitude. On a personal note, I wish I had known more of this history back in the late 1980s, so I could have asked Mr. Dana some pertinent questions when I met him at Edwards. Twenty years ago today — June 1, 1990 — the US-UK-German Roentgen Satellite (ROSAT) launched from Cape Canaveral on a Delta II. True to its namesake, ROSAT was an X-ray observatory, designed to last 18 months and to conduct both a full survey of the sky and detailed observations of points of interest. The mission far exceeded expectations, as the spacecraft operated into 1999. ROSAT not only discovered X-ray emissions from comets, as seen in the image above, but specifically observed emissions from the impact of Comet Shoemaker-Levy on Jupiter.